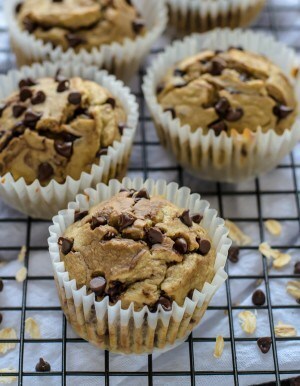 Chocolate chip banana oat muffins will change the way you make muffins! The quick bread batter is made in a blender instead of a bowl, so there is less mess. They’re gluten free, are lower in sugar, have no oil, and no refined flour. These healthier banana muffins are perfect for lunch boxes or after school snacks, too. Chocolate chip banana goodness – What’s love got to do with it? One look through my recipe database is all it usually takes to realize that I’m a lover of ‘naughty’ carbs. Not all carbohydrates are bad for our bodies, but most often, those are the ones that I gravitate toward. Sure, I like desserts, but my true obsessions are starchy, carb-loaded foods like muffins, breads, and pasta recipes. I also go crazy for chocolate chip banana recipes, as evidenced by recipes with chocolate chips, HERE and bananas, HERE. What makes today’s recipe for chocolate chip banana muffins so special is the way the batter is prepared. Almost all recipes for muffins are made by placing the dry ingredients (like flour and sugar) into one bowl and the wet ingredients (like eggs and milk) into a separate bowl. That step alone means there are two mixing bowls to wash, along with spoons, measuring cups, etc. Blender recipes, like this one, are fantastic because all of the ingredients are placed directly into a high speed blender. Because the blender has measurement markings on it, no liquid measuring cups are needed, but you will still need to weigh or measure your dry ingredients. Regardless of what type of blender muffin you want to make, the recipe technique is the same. This recipe is chocolate chip banana, but if you prefer peanut butter chips, go for it! Or use almond flour or coconut flour to make a lower carb muffin recipe. Incidentally, the next time I make these muffins, I’m going to add more chocolate chips to the top before I bake them. My blogging friend Erin did that with her blender banana oatmeal muffins and they look so much prettier than mine! Oh, and if you don’t care for chocolate, but still want a gluten-free banana muffins recipe, my friend Michelle has you covered! These are not bakery style muffins, so they won’t have large, domed tops. Bananas are dense, as are rolled oats. The hefty weight of those ingredients will prevent the muffins from rising very much, if at all. The good news is that they’re incredibly moist! Be careful not to run the blender very long. All you want to do is incorporate the ingredients, you don’t need to pulverize them. The longer you keep the blender turned on, the thicker and more dense your batter will become. The eggs in the recipe will lose their ability to tenderize, leaving you with dry, dense muffins that have the consistency of wet mud. Chocolate chip peanut butter wet mud is not a delicious treat! The carb count will vary. Depending on the type of sweetener you use, and whether or not you choose to use chocolate chips, the total amount of carbohydrates will vary. To reduce the overall amount of sugar (carbs) in the recipe, I used Erythritol, which is an all-natural, low glycemic sweetener. You can use , too. If you decide to make this recipe, please leave a comment, or share a photo with me on Facebook or Instagram. I’d love to hear from you! The items below have affiliate codes attached to them. I make a few pennies from any sales, which doesn’t affect your cost, but helps to keep this website operational. Thank you for helping to support It’s Yummi! Moist banana muffins, studded with chocolate chips. This recipe will make 12 standard size muffins or 24 mini sized muffins. To the pitcher of a high speed blender, add oats. Blend on high speed for 15 seconds, or until oats are mostly ground into flour. Add yogurt, eggs, vanilla, sugar, baking powder, baking soda, salt, and bananas. Mix until smooth. If you are using chocolate chips, remove blender blade, then stir in chocolate chips. Fill muffin cups about 3/4 of the way full. Bake for 16-20 minutes, or until a toothpick comes out clean or with just a few moist crumbs on it. Remove pan from oven and allow muffins to cool in pan for 5 minutes, then transfer to a wire rack to cool completely. *If you're making mini-muffins, reduce the baking time to 11-15 minutes. * I used Erythritol to keep carbs down, but you can use traditional white cane sugar and regular chocolate chips if you want. Could you omit the sugar/substitute completely? Or cut in half? I can’t tolerate the erythritol and don’t care for other sugar subs. You can certainly omit it. However, the problem with omitting ALL sugar sources from the muffin recipe is that they’ll look a bit pale. Caramelized sugar (or sugar substitutes) give baked goods that nice golden brown color. These blender muffins are SO good and so easy to make, Lisa! I’ve started adding some flax meal to them to up the fiber and reduce the carbs a little bit. I hope you try them! I love chocolate chips and banana bread. Have to try these muffins. Hooray! Please let me know what you think of the blender muffins recipe, Fern. Enjoy! Made them – so easy, so delicious! Thank you! I will be making these again! I’m so happy to hear that you liked the blender muffins, Fern. Thank you for stopping by to let me know! These muffins look and sound incredible! !